The slow liberalization of the gold market is a fact of life albeit slow and not likely to see huge tonnages [like 3,000 tonnes] flow into the country quickly. But in this gold market it doesn't take huge tonnages to move the gold price. The People's Bank of China [the Central Bank] is liberalizing to facilitate a professional gold market because local supply is being overtaken by demand. Even growing supply is not going to contain that controlled demand so gold will have to be imported in greater and greater quantities. The demand to date from China has been coped with by local supply, so the global market has not seen that demand. The addition of Chinese production to the total as well as its demand is primarily academic and has not affected the gold price to date. 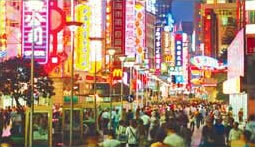 However increasing Chinese demand for gold will draw off from external supplies, so will affect the global gold price . In effect then demand over around 240 tonnes in China has to be satisfied by the market. So if the demand doubles [and for a country that size in the process of enriching itself, this would not stretch credibility whatsoever] the next 240 tonnes will likely come from London. This will draw off from a market taking the price up because demand is growing there. Now we can get enthusiastic about gold demand from China even over relatively small quantities. So we report that in the South of China, in Guangzhou, retail sales of gold coins and gold products had reached 7.82 tonnes since February. That would equate to 94 tonnes per annum. But what about the rest of the country? In Beijing [northerly part of the country] a favorite piece of gold known as "lucky balls" is proving popular. These are one-gram balls, worn around the neck or wrist and are selling in their thousands. The Chinese believe gold brings people good luck and is also a good investment and in China 'luck' is a religion. China will gradually relax restrictions on the shipment and trading of gold as the country deregulates the precious metals market, the central bank said. The nation wants to involve overseas investors, including banks, in gold trading, the People's Bank of China said in its annual report on the financial market, which was posted on its Web site today. The statement gave no timetable for the changes. At present, only China's four biggest commercial banks, together with some smelters and jewelers, may import and export gold. The nation also bars overseas investors from trading on the Shanghai Gold Exchange, which offers cash and cash-deferred contracts for 150 domestic banks, miners, jewelers and traders. "Relaxing trade rules will boost imports as domestic production cannot satisfy demand," said Wang Xinyou, a gold trader at the Agricultural Bank of China in Beijing. China's authorities want to make the exchange one of the world's leading gold markets, offering derivatives such as futures and options in addition to the current physical transactions, the central bank said today in the report. Copyright 2007 Authentic Money. All Rights Reserved. Julian Phillips - was receiving his qualifications to join the London Stock Exchange. He was already deeply immersed in the currency turmoil engulfing world in 1970 and the Institutional Gold Markets, and writing for magazines such as "Accountancy" and the "International Currency Review" He still writes for the ICR. What is Gold-Authentic Money all about ? Our business is GOLD! Whether it be trends, charts, reports or other factors that have bearing on the price of gold, our aim is to enable you to understand and profit from the Gold Market.